Sometimes the classic design is the best. What makes the classic design so good can be enhanced with modern technology instead of revolutionized and that’s the perspective of Kohler. Whether you want a two piece toilet, a one-piece toilet, or a touchless flush toilet, you’ll be able to find the perfect fixture for your home thanks to these fact-based Kohler toilet reviews. Are you ready to find the right toilet for your home? The chart below will help you quickly compare and contrast Kohler toilets so that you can make an informed choice about this important bathroom fixture. Why Are Kohler Toilets So Good? You’ll find in the comprehensive Kohler toilet reviews that you’ll be able to find the right configuration for your next toilet at the right price. These toilets have some of the best features that you can find on a toilet today as well, such as the dual-flush mode that lets you choose how much water to use with every flush. Get a toilet with a high water efficiency rating, a taller Comfort Height model, or even get a wall hung toilet if need be for your bathroom. Whatever you choose, one thing is for certain: Kohler fits your style. What Are the Benefits of a Kohler Toilet? Kohler makes a bathroom fixture that is perfect for your home. Although the focus of a Kohler toilet is on the classic design elements that have always worked, they have perfected the entire process so that you’ll have an excellent toilet at an incredible price! You’ll be able to get innovative methods of increasing the speed of the water flow through the toilet bowl, new ways to flush with touchless versions, and a low maintenance experience. Some might be a little disheartened by the fact that Kohler still uses 2-inch canister valves and trapways in their toilet designs. Although this doesn’t cycle water or waste through the system as fast as other toilets, the process is more efficient because the water speed is specifically regulated to achieve maximum velocity. You’ll also get an ease of installation that is second to none with this brand. Use our Kohler toilets reviews to make sure you get a top rated Kohler toilet that works for your bathroom and you’ll be able to have a long-term, reliable fixture for your home. Are There Any Problems With Kohler Toilets? 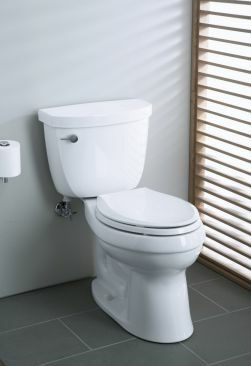 One of the biggest issues that people have with Kohler toilets is the flushing process. You’ll see this as a consistent complaint in many of our Kohler toilet reviews. This generally occurs because there ends up being a leak somewhere in the system. Look at your fill and flush valves primarily to see if the problem is originating there, but it could be elsewhere in the system as well. Because Kohler is also one of the lowest water usage toilets, it isn’t uncommon to find something that gets stuck somewhere in the system or returns as a leftover that requires a second flush. This is especially true for homes that have already low water pressure. How Do You Find the Best Kohler Toilets? When it comes to Kohler, you’ve just got to set what your budget is going to be and you’re ready to find a great toilet! 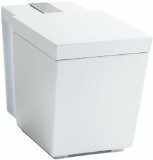 You’ll see in our Kohler toilet reviews that there is a price that is affordable for most budgets up and down the model line. You’ll be able to get a basic toilet that will still give you full functionality, yet you can still upgrade to get a massively modern toilet which will help to create a new retreat in your own home. If you’re limited in space, you may wish to consider the low profile, virtually tank-free models that Kohler has produced. They’re a little large for those half bathroom installations that are going on, but they will provide you with a rewarding experience. Kohler also makes a number of incredible finishes that will help you match the atmosphere that you’re building in your bathroom. Instead of the common white or off-white, you can go dark with a gray toilet if you prefer or choose from a number of other colors. This means you never have to settle! Are Kohler Toilets Easy To Install? If you’ve got a little plumbing knowledge, then you’ll be able to install a Kohler toilet pretty easily. 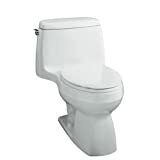 They work with standard rough-ins and can quickly replace an existing toilet. If you’re working on a brand new installation, you’ll find that these toilets are one of the easiest to anchor down into the floor because they’re fairly lightweight, yet still nice and strong. Disconnecting the tank from a two-piece toilet makes the installation process a lot easier if you’re flying solo. Pop off the cover caps on the bolts, unhook the toilet from its mounting, and then remove the tank first before attempting to remove the bowl. You’ll also want to make sure you’ve removed all of the water from the toilet before starting this process, otherwise you’ll have a big mess! If you have an older home, however, you may find that the rough-in from a Kohler standard toilet might not work for you. Take a measurement from your baseboard to the waste hole to determine what your rough-in will be. If it’s 10 inches or 14 inches, then you may need to contact Kohler to get a more customized toilet to meet your needs. Make sure to avoid any trim or backsplash that’s been installed to get an accurate measurement. What Are the Prices of Kohler Toilets Today? In our Kohler toilet reviews, you’ll quickly see that these are some of the most affordable toilets on the market today! Many models are priced below $400 on Amazon right now and you can get advanced models from Kohler for less than $1,000. In return, you’ll end up with a quality bathroom fixture that will last you for years to come! The Trellis version is up there a bit at $2,000 plus. However, the average price you can expect to pay for a Kohler toilet right now is about $400, including numerous models. How could the Kohler San Raphael be the best Kohler toilet for your home? The best feature of this toilet’s design is the twin touch flush actuator. It offers the industries best flushing mechanism that is available on the market today, but it does require a GFCI outlet in order for it to work properly. You’ll use 1.6 gallons per flush when properly installed and if you’re looking for LEED points for certifying your business, this toilet will qualify for water efficiency points. Although you’ll pay a premium price for this particular Kohler model K-14247-FL-0 toilet, the benefits you’ll receive in owning it will make it worth the investment. It is easy to install, is comfortable to use, and offers your bathroom a unique take on Americana that will give you a distinctive look you may be wanting. Inspired by English chintz patterns, the Trellis conveys the way in which the floral “climbs” over the suite of fixtures. It features the Ingenium R flushing system that helps to control the amount of water that is flowing through the tank into the bowl for maximum rotation and can stand up to repeat wear and tear. The primary advantage that comes with this particular toilet is the Ingenium flushing system that has been incorporated into it. This system uses and industry standard 2 inch flush valve that specifically regulates the amount of water flowing through the toilet’s system. Instead of dumping all of the water in at once, the flow of water is regulated to create a specific swirling action that helps to clean the interior of the bowl with every flush. The one design issue we have with this toilet is in the placement of the trip lever. It’s on the left hand side and pointed toward the back instead of toward the front. Although it has plenty of clearance for the installation, your hands don’t always have the same amount of clearance. There are a number of advantages that come with this specific toilet, but it all boils down to form and functionality with the Kohler Memoirs. If you’re tired of a builder’s grade fixture in your bathroom and you want something that’s going to provide you with good, long-term results, then this is the toilet for you. It does sit away from the wall just a little bit and the flushing action is a little louder than you’d expect for a modern toilet, but overall it works hard to get the job done and that’s what ultimately matters. The primary feature we really loved about using the Kohler Cimarron was how it has been designed to make installation an easy, better process. Of note is the Dry Lock system that is included with this toilet. It helps you get the installation done right without much of a hassle and provides a foundation where you can keep the floor dry, eliminating the possibility of dry rot around the fixture. It is definitely one of the easiest toilets to install today! Are you ready to experience the benefits of timeless design, only updated with modern technology? Then you’re ready to discover your next toilet through our Kohler toilet reviews! Take a look today and you may just find the perfect toilet for your home. Not totally sold on Kohler? Take a peek at our Ultimate Best Toilet Guide over here.